Love of Land. Reverence for Water. Respect for Fire. 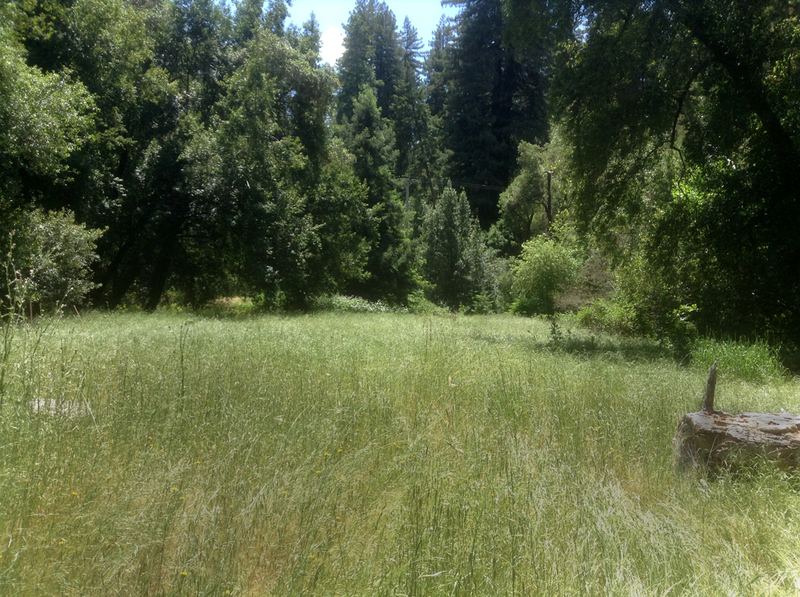 To me, this is the Druidry of California. It shapes my land and my practice. It’s the bucket under my tap as the water warms for a shower. It’s the ashes from the pipe I tap out into my open palm to be *sure* it’s out when I walk the hills. It’s the feeling of being home the first sight of poppies gave to me after three months in the Pacific Northwest. 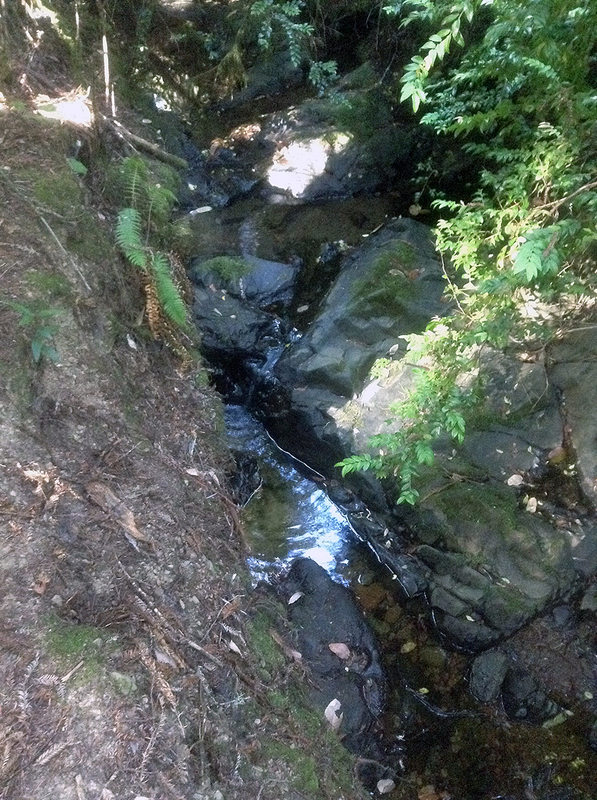 Going to the homes of Druidry wasn’t at all what I expected, but it was everything I needed. I thought I was learning the forests the ogham sprang from, but I was gaining a greater appreciation of the trees I grew up under. Never had I realized just how dry my home is. Or how much of our ancient forests still remain. 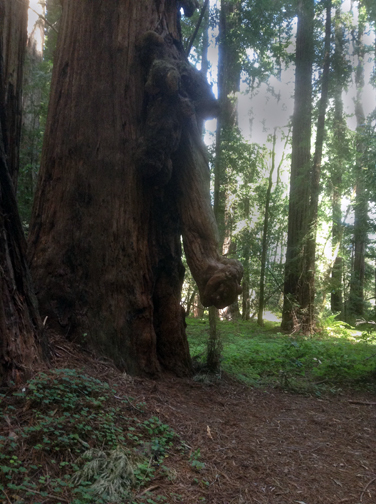 Here, I can stand inside a redwood and feel its great silence. The fact that human habitation here for so long was among the trees rather than in place of them means that much more of the forest remains to experience, and to learn from. 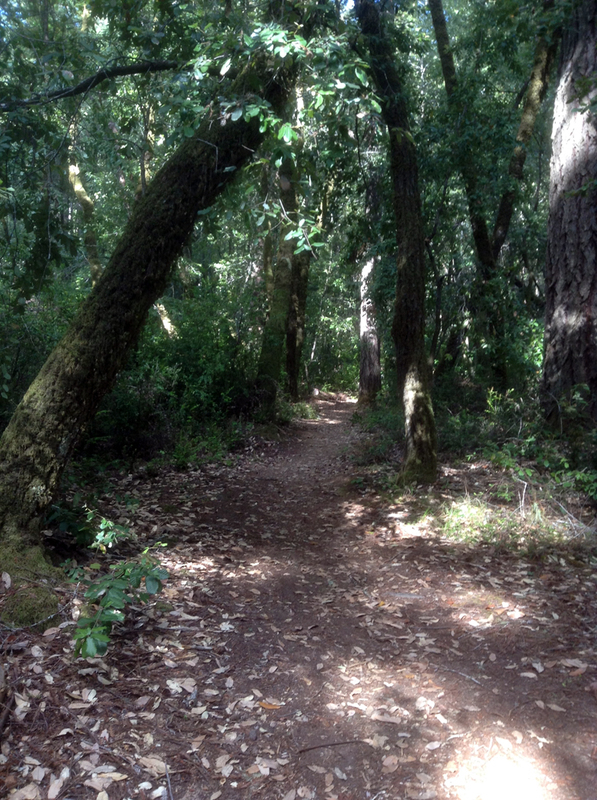 We went to Mendocino this weekend, my seed group and the new seed group that hived from it–was it only a month or so ago? This time, it was my home in Oakland that created the contrast. My bed was hard, but the trails were soft. Trees everywhere, and no one cared what I looked like or what I wore. I could talk to any nonhuman I pleased because there was no one around who thought it strange. Most of all, when I went down into the forest and just opened my ears I could *think*. Birds, the wind, and the rushing sounds of cars almost nonexistent. 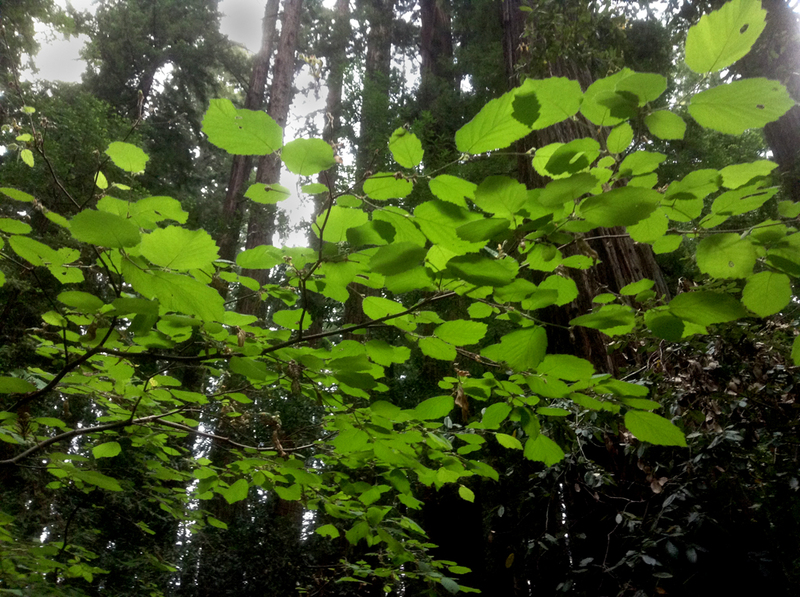 California hazel is all through the understory. The leaves are furry, and each branch lies roughly on a plane which makes it seem to float above the ground. The whole tree is ethereal, as if it had its roots in the Otherworld. perhaps it does. Unlike its more substantial relatives in Britain, it grows as a series of slender poles. It is as if it has coppiced itself. 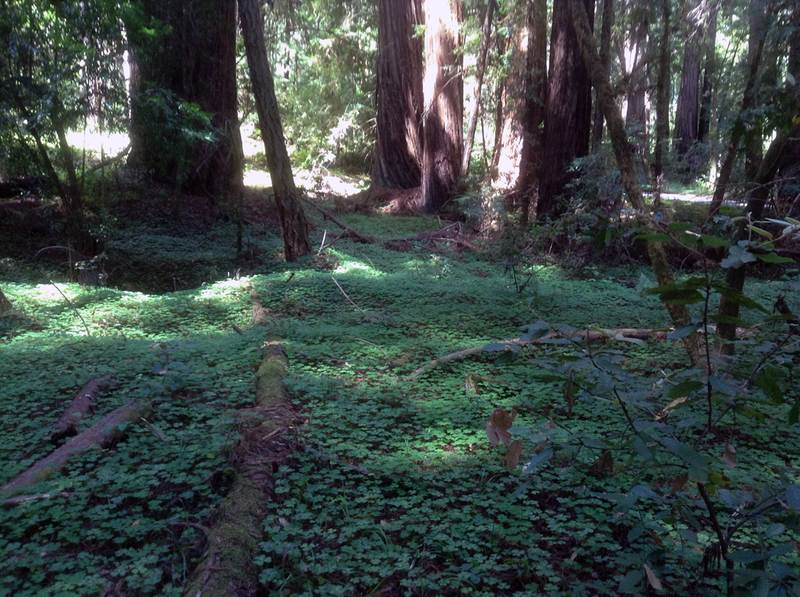 Poison oak is, of course, everywhere. In the old growth, however, it is part of the picture, in balance with the rest of the plant community. 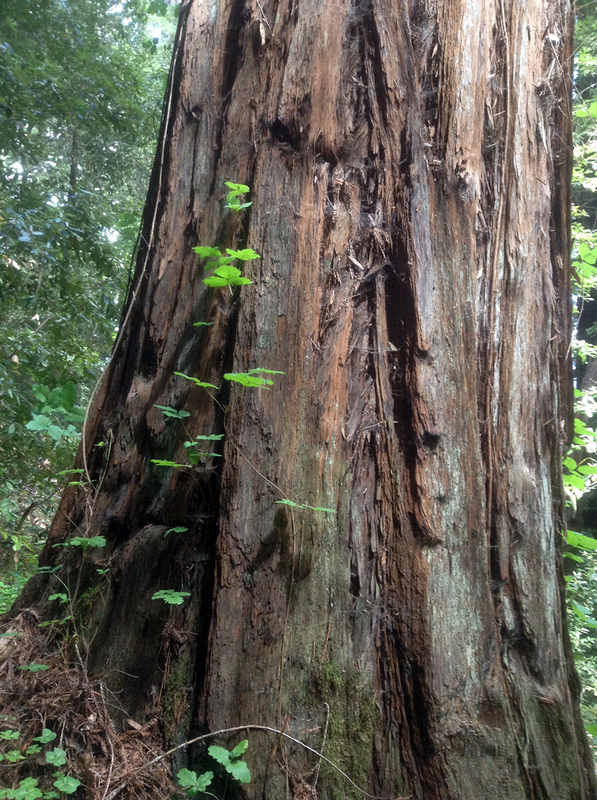 It climbs the redwoods like an ornament, startling green against the rough reddish bark. 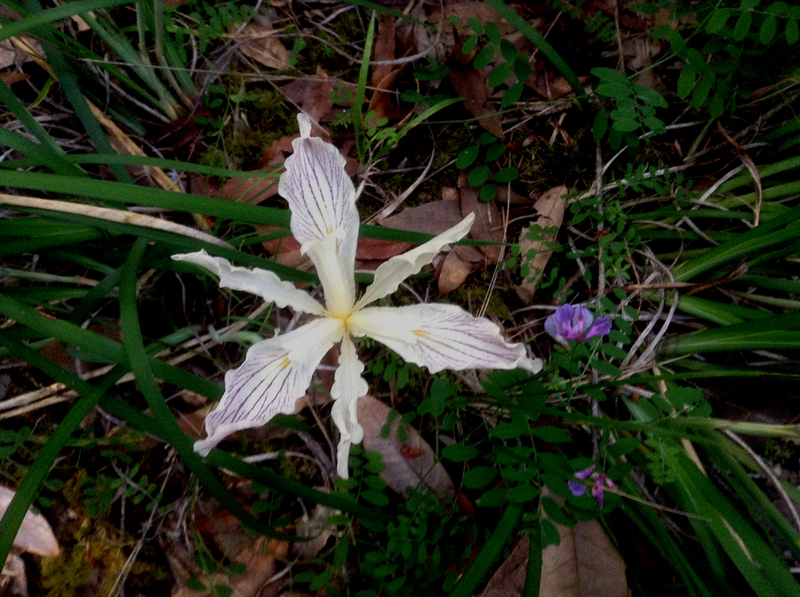 Yellow Leaf Iris, one of the flowers of the understory. The sorrel covers the land, outlining it in floating green. 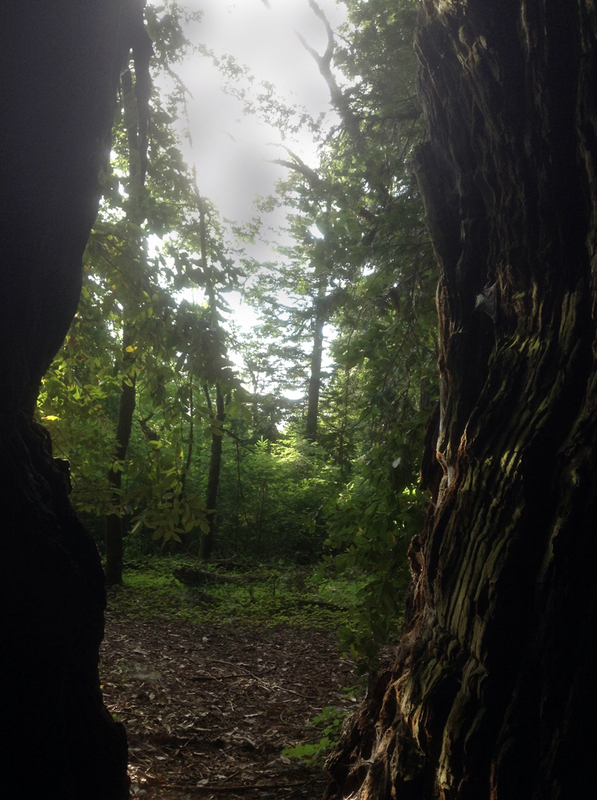 I learned a lot this weekend, between the ancient forest and the people I was with. 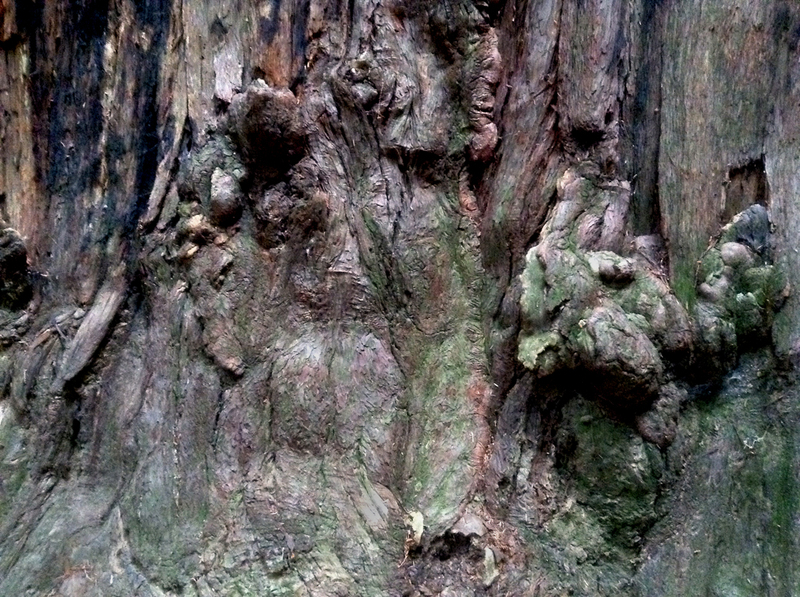 Burls are a redwood’s way of trying to stabilize itself. A living buttress for a cathedral of a tree. This tree is called the Pan Tree, and I’ll bet you can figure out why. One friend taught me about burls, the other taught me what brewer’s droop was, all from the same example. You can’t say this pack ‘o druids lacks scope! Not all the trees are rude, however. This one, like many of the larger ones, has hidden depths. This one has grown into art. 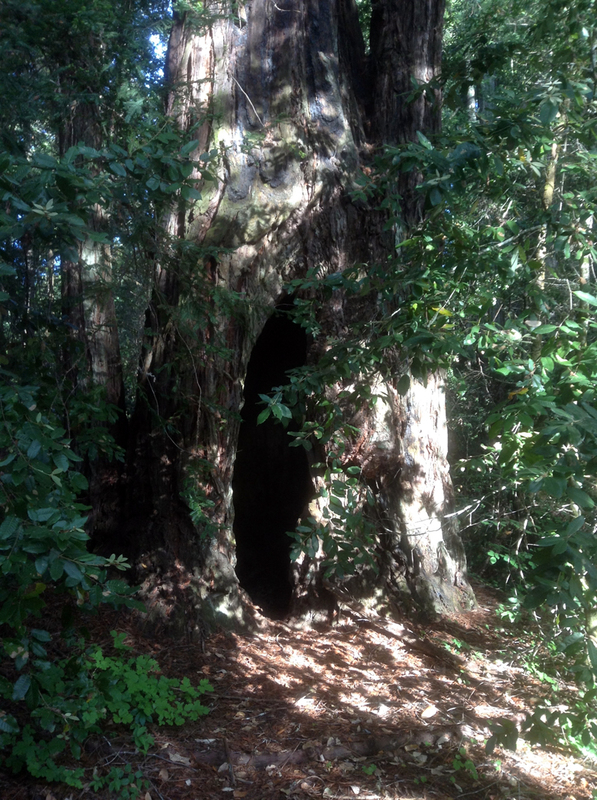 As I walked up the path, the redwoods gave way to Douglas Fir. 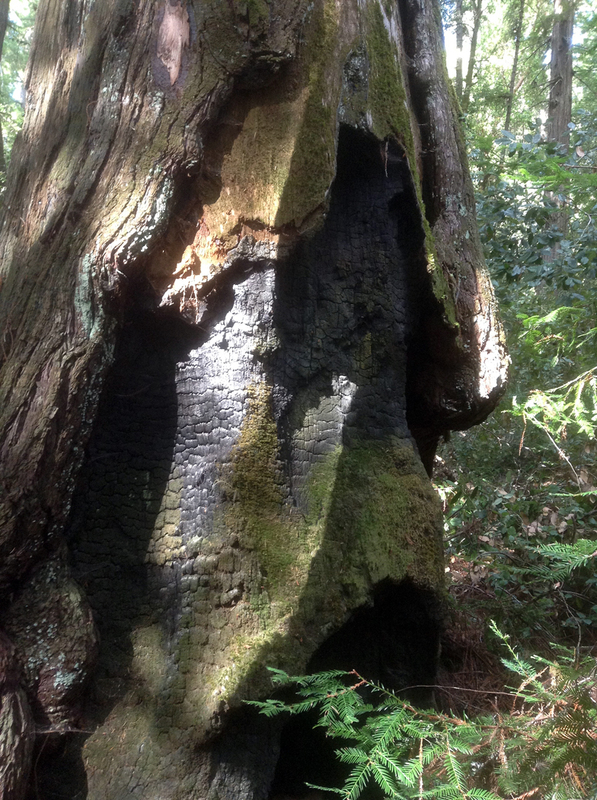 This tree is scarred by fire, as the redwoods are. How different the shape it takes from that, however. This was the only running water I saw. There’s a river deep enough to swim in, but that is another adventure for another time. The calm of the forest is still surrounding me, along with the warmth of fires and shared wisdom, and for now that’s all I need. from up here in mendocino county! 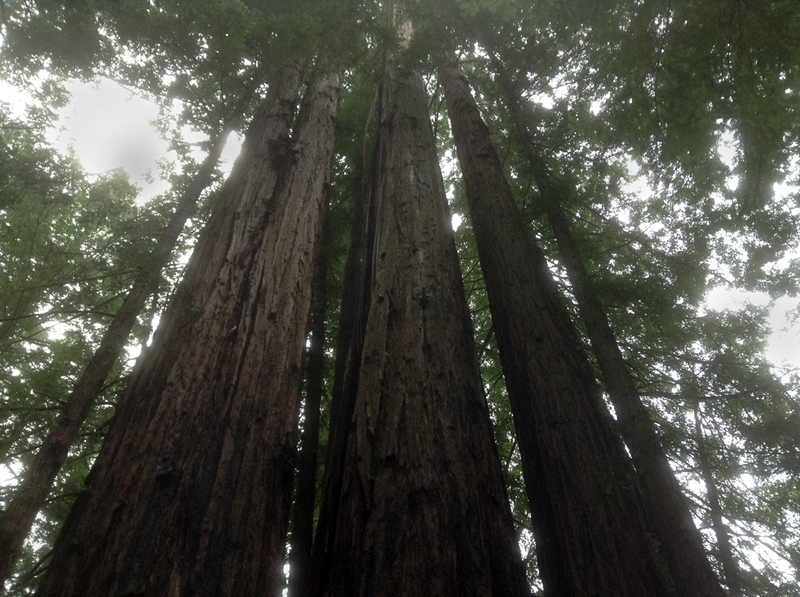 The redwoods are often one tree. Growing from an older root system, or twining their shallow roots together they were once all connected physically. The larger the area we leave them the wiser they collectively grow.